Th-INK-ing of You: Welcome to the June ODBD release!!! Oh Happy Day!!! Welcome to the June ODBD release!!! Oh Happy Day!!! Hello friends! 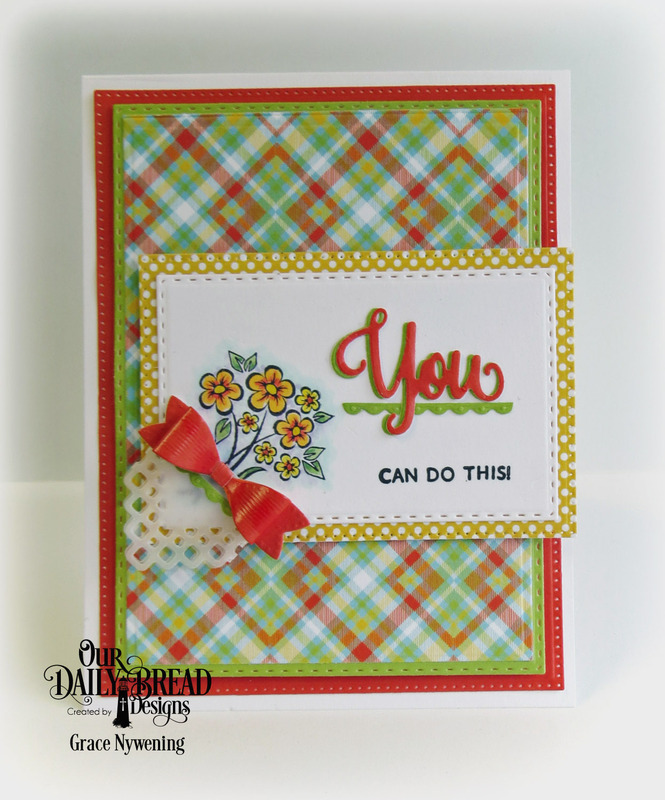 Welcome to the Our Daily Bread designs June release! I'm so thrilled to be able to participate in this release as it is one HaPpY ReLeAsE! You cannot view these fun bright colors and incredible stamps and dies without a happy smile! If you want to see the full release in one place, you can view it on the ODBD Blog. To further add to that smile... three of our hoppers will win a $25. gift code to the ODBD Store just for leaving a comment on the DT blogs! You have until Jue 2, 2016 at 9:00pm to leave your comments and the winners will be posted on the ODBD Blog on June 3rd, so be sure to check back there to see if you won! For the card above I used the new set You Bless Me So, which I just love! This is a die and stamp combination set and has sooooo many possiblities! It's one I suggested to Kelley some time ago and I'm so happy to have it in stamps and die now!!! I know this will be a "go to" set for me! I also used several fun new and past released ODBD Custom Dies: Bitty Borders, Mini Bow, Pierced Rectangles, Double Stitched Rectangles, Rectangles, and Layered Lacey Squares. I also used the newly released Birthday Brights Paper Collection. I colored the cute little flower image with Copics and used a vellum sheet cut with the Layered Lacey Squares to create a little paper "wrap" for my bouquet. I just love the bright fun colors this month! The make my heart happy! I also love the sentiments in this new set! I hope you do too! 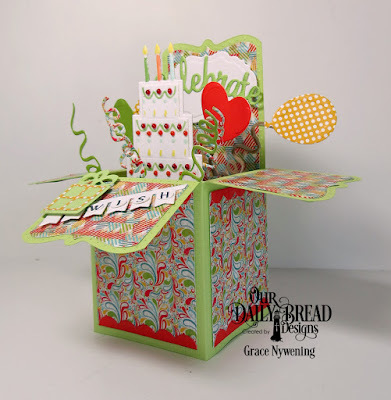 For my next project I used a bunch of new ODBD Custom dies to create this pop-up card box! I gave this to my daughter for her birthday and she just loved it! If you love fun interactive cards... this is a must have die! I used the following new dies: ODBD Custom Surprise Box, Bitty Borders, Bitty Banners, Cakes & Candle, Celebrate & Wish, Balloons & Streamers, Mini Tags & Labels. I also used a past stamp set, Pennant Swag Alphabet to stamp the letters wish, and added them to the Bitty Banner. Other than that, this card is completely made of dies! How fun is that?!? The paper used here is Bazzill textured for the base, and the new ODBD Birthday Bash Paper Collection, and ODBD Brights Paper Collection. The box is so easy to put together because the die even scores the fold lines so it's literally a cut, fold adhere and decorate project. The really neat thing about this box is it folds totally flat and can be mailed in a square or larger rectangular envelope. I used a 6x6" for this one but it would have fit in a smaller one. It also fit in a 5x7 envelope with room to spare on the length. I hope you enjoyed my samples as much as I enjoyed making them! I am in the process of doing radiation now. I go 5 times a week, and I have 4 weeks to go. Looking forward to being done!!! Thank you all for your continued prayers!!! They mean so much!!! Awesome samples, Grace! That Surprise Box is jam packed... love it!!! I am new to your blog and I am now a fan! The card is bright and cheery, so cute. I love how you describe why you are such a fan of card making. Perfect. :) The box die looks like so much fun!! 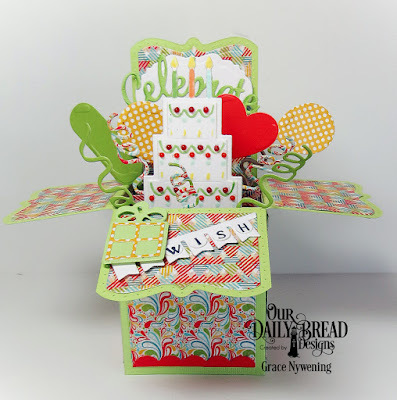 Hi Grace - I love the color schemes you have chosen for the cards and the surprise box designs - I just ordered my surprise box dies from ODB and can't wait until they arrive to try out! OMGoodness Grace!! You are still going through so much and yet you are still creating away!! I so admire you! Your card is really cute with all the plaid and your box is outstanding! I still have NOT finished mine. I love all the happy papers and surprise elements looking like they just POPPED out of the top!! What a fantastic birthday surprise for someone! Love them both sweet friend! Simply awesome! I love your color palette and the adorable birthday box card. Both of your cards are very sweet. I especially like the hankie added to the bouquet on the first card. Yea! Excited to see you felt like creating Grace!! I've been praying for you and will continue!! You certainly brought this happy release to life! Love each one of these bright and cheerful beauties! Love too you suggested these to Kelly! Really versatile sets! Wow the colors in the box card. They are beautiful and really stand out. Both of your cards are stunning, Grace!! I just love the bright cheery colors and the design of the first card and the details of the box are perfect!! I am so glad you were able to create and join us this month. You know you are always in my thoughts and prayers. TTYT!! Your ideas are awesome. Love your cards. Awe Grace...you have done it again! You have made two awesome cards. Love the colors and absolutely love the box surprise card, it is paced full. Can't wait to try to make one of these for someone special! Praying for you! It is so good to see you here and to see these great creations. ThThanks for sharing.e box is wonderful, and I agree - there are special sentiments in this release. Thanks for sharing. love that plaid paper! great job on both projects! That pop up box is so much fun! And your card is so sweet and cheery. Thinking of you and sending healing thoughts. beautiful cards!!! love that stamp and die set on the first card!! They sure brought a smile to my face. Awesome samples Grace! Fabulous cards! 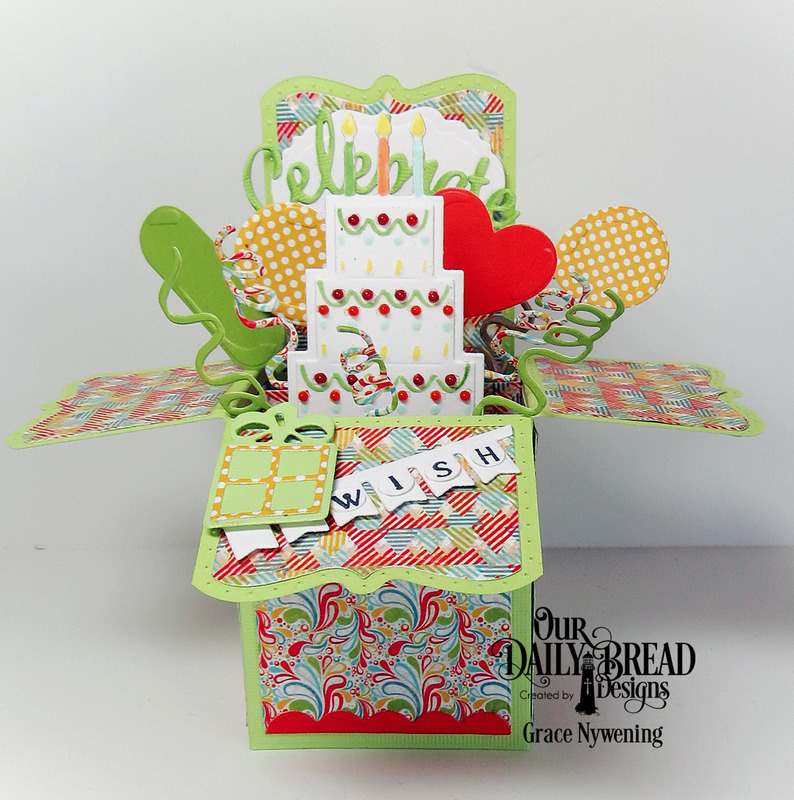 Love the sweet flower stamp you used on your first card and all your delightful details on your fun box card! So glad to know that your treatment is going well and coming to an end. I like the colors and patterns on your projects. Such wonderful projects, I especially love the flowers on your card! Great job! Fabulous cards! I love the cheery papers and colors! These are both fabulous projects. Your card with those delicate flowers is so lovely. Your surprise box is fantastic! You have packed it with so many different elements!! Makes me want this for sure!!! Both of your cards are so sweet!! Your box card is my favorite of all these cards. It is STUNNING and has such GREAT COLORS. I am in awe of it. WOW! I cannot say enough about it but WOW! Both the card and surprise box are cute. Love the layering and colors. WOW WOW WOW!!!!! Your first card is so happy and cheerful! But that box just blows me away!!! And thanks so much for the info about how it fits into an envelope! Good to know! Oh, Grace, I love the "happy" colors and your beautiful designs! I love the first card with the great plaid and beautiful focal image! Love the flowers with the "you" die and sentiment! And the pop-up card is amazing and such a delight! Now that's what I call taking the work out of this card. It's something (I think) I could even manage - hehe! Beautifully done, sweet friend, and I continue to pray for you and praise God for all He's brought you through and will continue to. Much love and hugs!